How to Install an Application using Cydia. How to Install an Application. How to Add a Source to Installer. How to Delete a Source from Installer. How to Use the Queue in Installer. How do I share links from Safari? 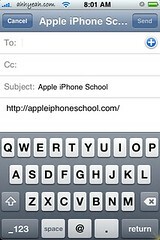 You can share links from Safari by emailing them. 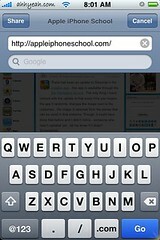 In Safari tap on the address bar, then tap share in the upper left corner. This will compose an email with the website name as the subject and the link in the body. Just add a note if you’d like then send! How do I know what firmware I have on my iPhone or iPod Touch? Please see our “How to know what firmware is running on your iPhone or iPod Touch.” page. How do I get an image next to my comments? Please see our Create your own Avatar page. How to Take Screenshots (firmware 1.1.4 and below)..
How do I change the dialer on my iPhone? Please see our How do I change the dialer on my iPhone? post. How do I add Wallpapers to my iPhone? Please see our Adding Wallpapers to Your iPhone post. How do I add a new dock to my iPhone? Please see our How do I add a dock onto my iPhone (firmware 1.1.4 and below)? post. How do I get a theme onto my iPhone? To choose the version hold down the shift key (option key on macs) and then select restore. This will open a window to allow you to choose a file to restore the iPhone with. Your options will be located in the $:\Documents and Settings\your-user-name\application data\apple computer\itunes\iphone software updates\ (library/itunes/iphonesoftwareupdates on macs) folder. How do I get that theme, program, icon, dock, etc.? Why don’t they show up for me in Installer.app? You probably haven’t added some of the additional sources available for Installer.app. There are many more sources out there but not all can be completely trusted. You add them by opening Installer.app, tapping on sources in the bottom right corner, edit in the top right corner, then add in the top left corner. You can find a list of all knows sources at AppleiPhoneSchool.com/sources. Once you’re done, tap done in the top right corner. Installer.app should refresh the sources automatically but sometimes it takes twice for them to show up correctly. Try it a couple more times. It’s known to take 3-4 times opening this app the first time to get it to stay open. If you don’t get it to stay open, email me at help@appleiphoneschool.com and I will try to help. Hi, if I decide to jailbreak my iphone 4, will my apps. music, photos, etc., get deleted? Thanks! I will make certain to bookmark your blog and definitely will come back later on. I have i phone 5s i want to jailbreak my phone .If i jailbreak can i access all applications after jailbreak .For Ex What’s app, Skype and Facetime.i am waiting for your reply……..